or set up a screen. Sectioning off the area creates a personal haven where kids can turn when they need a break. Tough day? Make this a place to chill with a large pillow or beanbag chair. 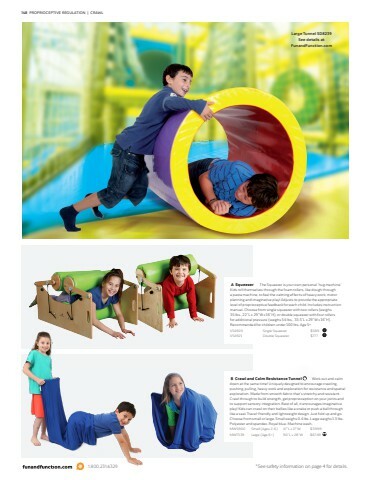 Sensory-seek- ing kids might also enjoy sitting under a weighted blanket for grounding pressure while they read or relax. Fill a basket with favorite books, fidgets or other sensory tools. Noise canceling headphones may help to further block out distractions. Make your space calming with a bubble tube, glowing LED ball or fiber optic lights, all of which are safe and cool-to-the-touch. Those that change colors offer a mesmerizing and inter- active experience. Turn on soft, classical music to make the environment more soothing. if you’re tight on space, carving out a specific area and incorporating sensory tools can go a long way.